A lot of interesting teamreports, onboards and a historical flashback of the 70`s and 80`s US-pullingscene with closeup footage of the retired Tractors in the PullingMuseum. - a great report about the worlds biggest event, the NTPA Super National Pulling in Bowling GreenOhio, the capitol of the pullingsport. - on board cameras on the sled and cockpit, creating great scenes, like "The Fury" Modified, "Unleased" Unlimited 6 x V8. - fire and engineexplosions, slow-motions, good filmmusic. - many teamreports and driver-interviews: Kathy Archers "Black Widow", Brian Shrameks "Unleashed" Pulling Team, Rat Poison, Ken Veneys new Funny Farmall. Bret Berg`s "Money Maker", Keith Horst`s "The Fury", Bob Barbee`s LSS "Stormy", Esdon Lehn`s "Red Line Fever" IH-Super Stocks. - backgroundinfos and closeup footage of the best looking tractors and engines. - the Stars of the ProPullingLeague with spectacular Pulls, like "ShelShocked", Roberts Pulling Team, Barga`s "The Judge" and "Appache", "Texas Bullwip", "TakesALikin". - the best pulls from the southgerman event in Krumbach abd the Austrian pulling events. - EuroCup Pulling in Made Holland, Minis and SuperStocks produce a wonderful Show. 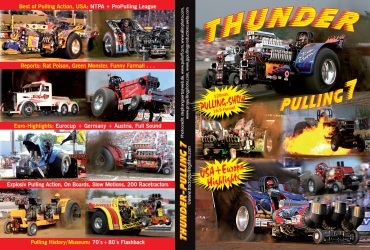 "Thunder Pulling 7" is as spectacular as the other parts of this series, with lots of interesting and new pulling machines and you should not miss it in your collection. For Euro 19,90 you get 2 hours of worlds best tractor pulling entertainment. Feel and enjoy the Power of Pulling on the "Thunder Pulling" series.